1) Food was marinated, vacuum packed and then sterilized under high temperature. No preservative added. 2) The food grade plastic may wrinkle slightly in high humidity. This will not affect the quality and safety of the product. 3) Please do not consume the product if the vacuum pack is broken or swollen. 4) To assure safety and best condition, please consume the entire product within two hours once vacuum pack is opened. Allergens: Egg, Wheat, Soya, Liquorice. 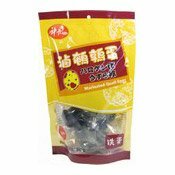 Ingredients: Eggs (96%), Water, Soy Sauce (Soyabean, Wheat, Water) (1%), Salt, Sugar, Spices (Cinnamon, Lime, Cumin, Cloves, Chinese Liquorice, Bay Leaves), Flavour Enhancer (E621). 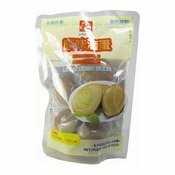 Simply enter your details below and we will send you an e-mail when “Marinated Eggs (Original Flavour) (原味滷蛋)” is back in stock!